Last weekend one of Alex’s friends from college came to visit us with his girlfriend. 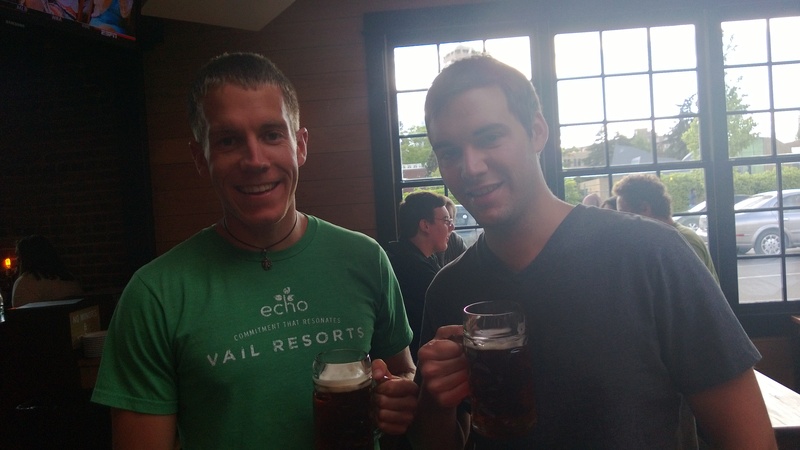 Alex and Sammy lived next door to each other during our sophomore year of college and became great friends once they learned that they both share a similar sense of humor and a love of beer and video games. Sammy had come to visit us during our first full summer living out here and had a chance to do the touristy stuff before, but Amy had never been to Seattle and wanted to soak it all in. We spent a lot of time eating and drinking. Come to think of it, that’s about all we did! Once they arrived on Friday, we met Sammy and Amy for lunch at the Hi Spot, a restaurant in our neighborhood. From there, we went back to our house to get settled before going on a little walk down to Lake Washington. We scooted back up the hill, grabbed a quick happy hour glass of wine at the Bottlehouse and then hopped on the bus to go check out Capitol Hill. The sun poked its head out right as we were leaving Von Trapps, so we decided to go back to our house and grab some Thai food to eat out on our patio for dinner instead of going to a restaurant somewhere. It was a wonderful evening. Saturday morning Sammy and Amy decided to be overachievers and went for a run while Alex and I sat around in our pajamas. We had a great breakfast casserole before we left for the day to go out to Woodinville to the wineries. Washington is the third largest wine producing state in the country, which is obviously amazing. The grapes are grown over in Eastern Washington between Yakima and Walla Walla, generally known as the Columbia Valley. Many wineries have tasting rooms at their Eastern Washington production sites, but there is a darling town just about 30 minutes east of Seattle called Woodinville that is exploding with new tasting rooms that keep popping up everywhere. It sure makes for a fun thing to do when friends come to visit. 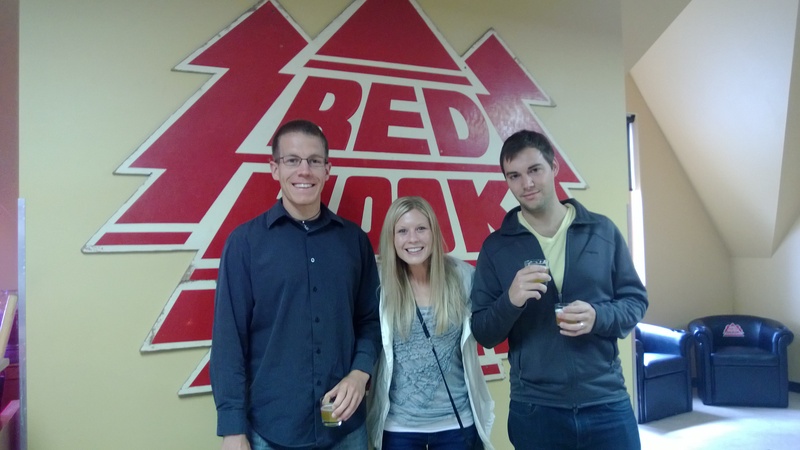 We started our Woodinville excursion at Red Hook Brewery where we took a beer tour. From there, we walked up about 2 blocks to Patterson Winery, which I had been to a few times. There is a cute little pizzaria called The Station next door so we were able to grab a pizza and sit outside to do our tasting and just hang out. 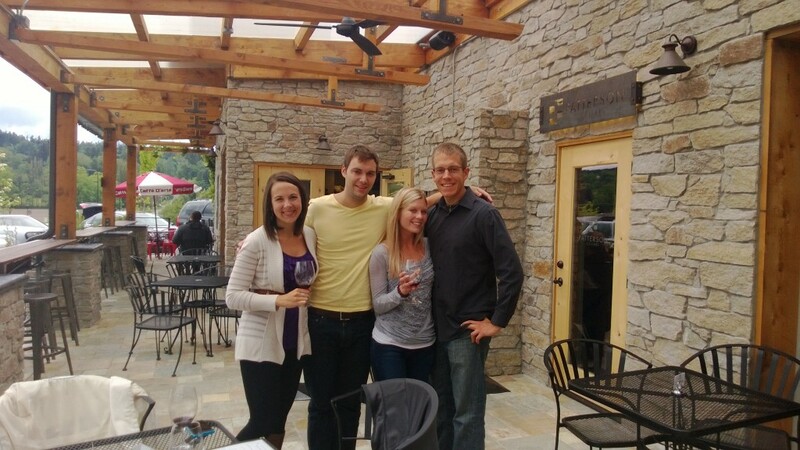 Drinking wine on the patio at Patterson Cellars. After Patterson we walked across the street to J Bookwalter, an old favorite of Alex’s and mine. 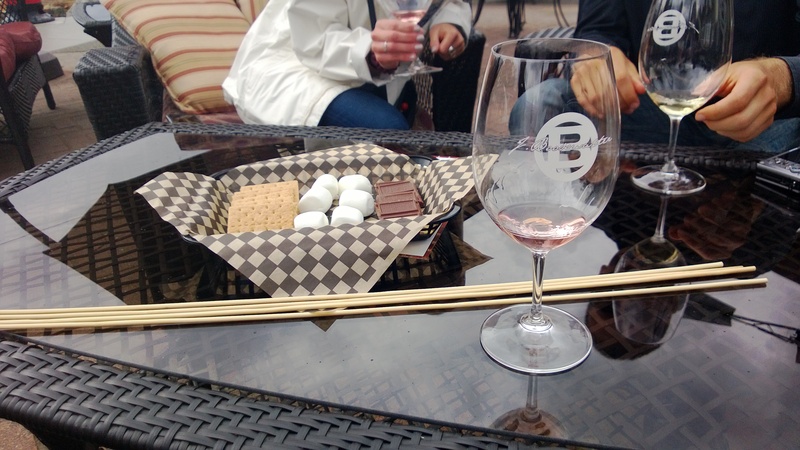 They had just added an enormous patio with an outdoor kitchen to their winery, so we lounged in their comfy chairs for quite a while as we lingered our way through the tasting. 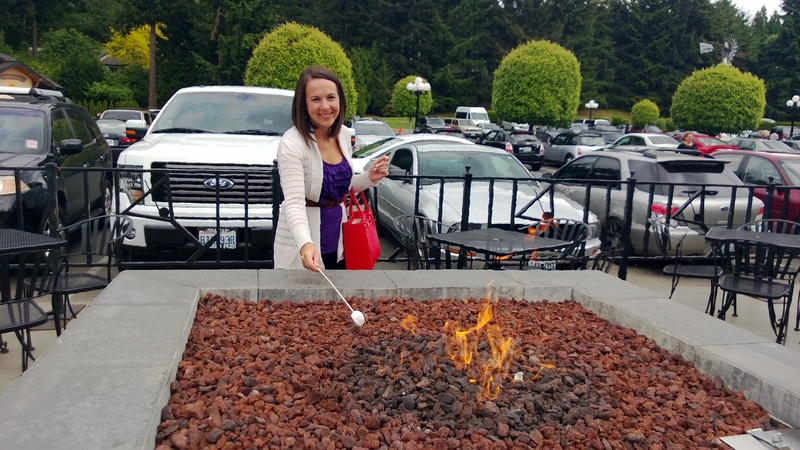 Our “s’mores kit” at J Bookwalter. 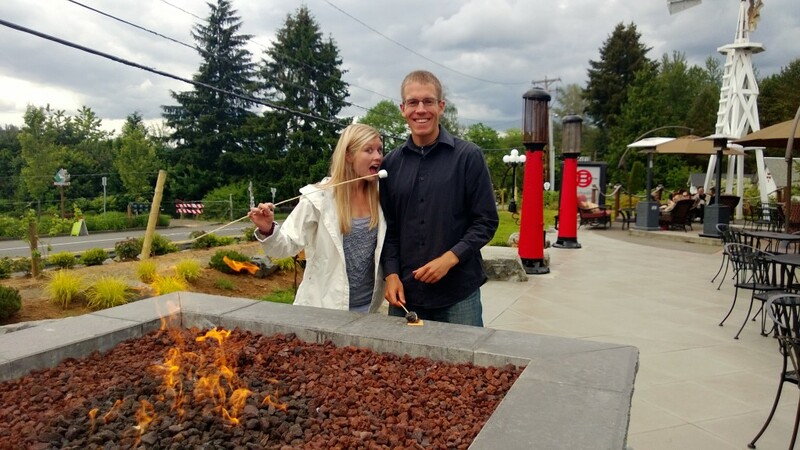 Since we had just eaten lunch we weren’t hungry, but once we found out they had s’mores available, we couldn’t resist. 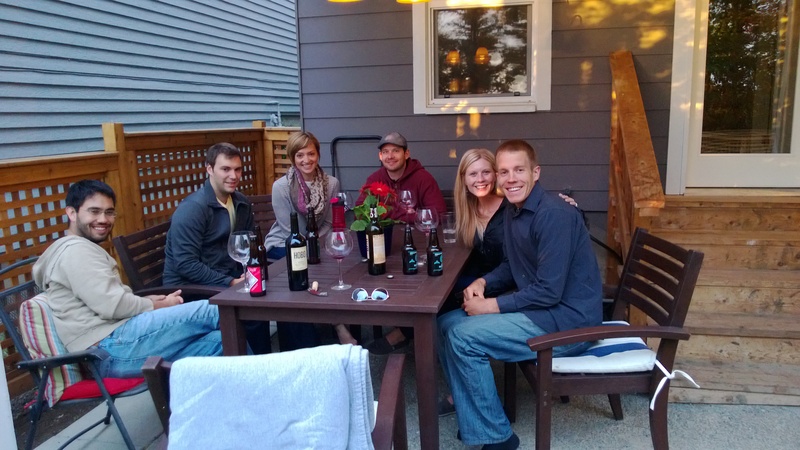 Once our wine tour was complete we headed back home to drink more wine and grill some dinner with additional friends who came over. Ryan, Mary, Justin and Jamie ended up coming over to hang out and grill up some brats. Sunday Alex and I had to get up early and drive down to Oregon to pick up our little Jackson, so Sammy and Amy were on their own to tour the city. Once we all got back we had dinner at our house and hung out with the dog. Alex and I stayed home with Jackson on Monday while Sammy and Amy took the ferry over to Bainbridge Island to check things out. We ended their trip with a wonderful dinner at Quinn’s Pub, one of our favorite restaurants in Capitol Hill. This entry was posted in Food, Friends, Fun, Life and tagged friends, weekend, wine on May 26, 2013 by Alison Allen.